2011: 0.34% of the total Federal budget is allocated to ocean and coastal support, $12.2 billion. 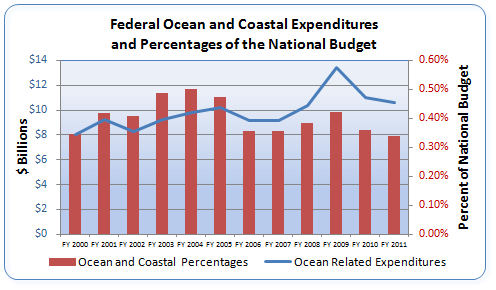 2010-11: Federal ocean and coastal expenditures decreased 3.5% (2005 dollars). 2000-11: The Federal government spent $118.4 billion on the oceans and coasts. FY 2009: $4.1 billion were added to the 2009 oceans and coastal budgets by the Economic Recovery Act of 2009. Federal Ocean and Coastal Expenditures (civilian investments) are categorized by Federal departments and agencies (excluding military activities) in the Administration Ocean Budget Dataset, FY2000-FY2011, and the NOEP Time Series Dataset, FY1970-FY2006. These datasets show increases, decreases, and funding trends. Data have been collected from the Office of Management and Budget's (OMB) reports: the annual Budget of the United States Government, and the biennial Federal Ocean and Coastal Activities Report. Data are available for download in both nominal and constant dollars. See About the Federal Ocean and Coastal Expenditure Data and Federal Ocean and Coastal Expenditures Terms. 1970-2011: Federal ocean related expenditures increased 33% from $6.2 billion to $8.3 billion (2005 dollars). 1970-2011: Federal ocean related expenditures as a percent of total federal expenditures decreased 58.5% from 0.63% to 0.26%. 1977: Most funded year: $15.6 billion was spent on the oceans and coasts, 47% more than in 2011 (2005 dollars). The	NOEP Time Series Dataset is very limited. See About the Federal Ocean and Coastal Expenditure Data for additional information. Note: All graph dollar values are shown in as 2005 dollars.